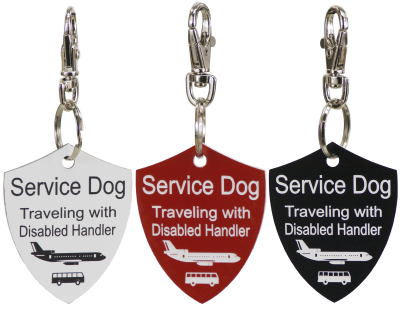 These Engraved SD Travel Tags are included in our Service Dog Travel Information Packet. They are such a hot item we decided to also offer them seperately. These tags are a must have when traveling with your service dog. The tags are a 2.5" shield style plastic engraved two sided tag that can be used on the dogs collar, harness, or vest. The engraved tag states on one side that this is a service dog traveling with a disabled handler and the other side is the ADA law and Aviation Protection information with phone numbers. This tag comes with a trigger snap clip attached to it for easy application.